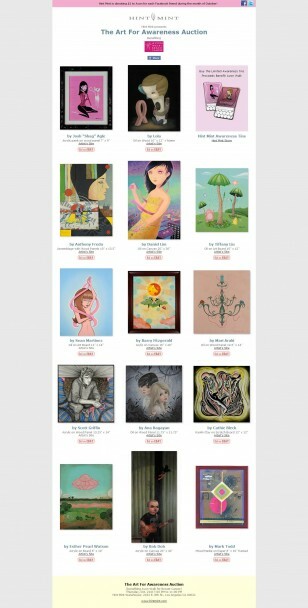 Great Art, Great Cause, Great Prices – Everybody Wins! When you work with a group of great designers and artists, you get exposed to a wide variety of new artists and styles, get to go to gallery openings and exhibitions, and get to longingly wish that you could afford one of those pieces for your own home or office. Well – along comes Hint Mint and their “Art for Awareness Auction“, and you can benefit the Avon Walk for Breast Cancer and pick up a beautiful piece of art for a heck of a price in their ebay auctions! With artists like Bob Dob, Lola, Cathie Bleck, Mark Todd, and more, it’s a heck of an opportunity to start/add to your collection, but you better jump in, since most of the auctions end tomorrow.